I wake up early. Sometimes I wish I would allow myself an extra hour of sleep, especially on days that I work from home. But the need for alone time in the morning is much stronger than the need for extra sleep, which most sleep experts would probably frown upon, including the logical part of me (Since I wrote a post about it). But, until my children learn to sleep in later, I will suffer the consequences of not enough sleep, which I will likely regret around the age of 50. Mornings have always held a special place. Rolling out of bed and getting on with the day, doesn't quite work for me. I want 2 cups of coffee, food and time to just be. The silence of the morning feels purifying in a way. An invitation for the day to be whatever it may. In those moments, there's blind possibility. January is quiet. I listen closely for a chirp, a sign of life outside my house, but aside from the occasional car and the hum of the refrigerator, there's silence. I have permission to collect my thoughts and because quiet moments are a rare commodity, I appreciate them even more. It's New Year's Day. While I rebel against the notion of resolutions, I do enjoy the feeling of a fresh start. Life is a series of reinventions, whether it's in the middle of the year or on January 1st but I do understand the need to hit the re-set button after a potentially gluttonous month. Most people opt for a diet change around this time of year and while I think that's a good thing for many reasons, I often think it ought to be more of a permanent shift. One in the direction of eating whole, real food that's minimally processed. People often assume this means eating bland food or needing to spend countless hours creating a dish. It means, using real ingredients and making delicious food that's simple and satisfying. It doesn't have to be complicated to be good. Take this 3 ingredient breakfast for example. 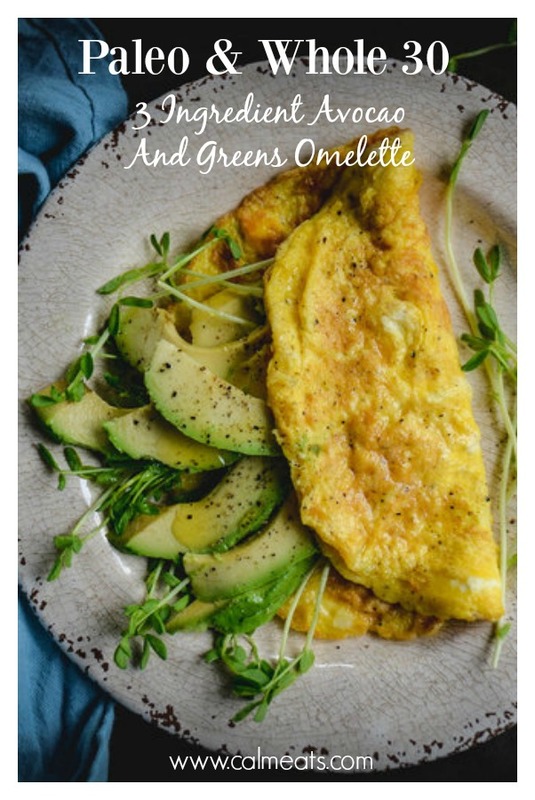 In the time it takes to wait for 2 pop tarts to pop out of the toaster, you can cook this very basic omelette. 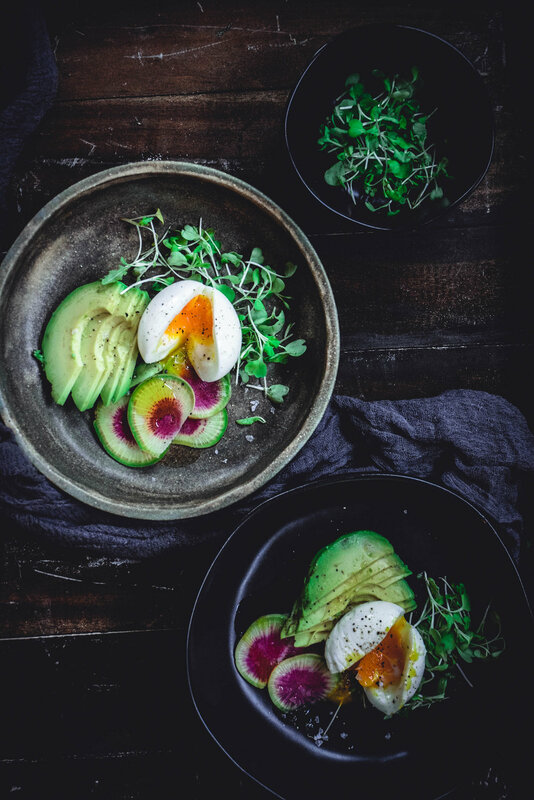 All you need are eggs, salt and pepper, some fresh greens and avocado. You'll feel full, your blood sugar will be stable and you won't need to have a snack an hour later when you would have otherwise crashed. 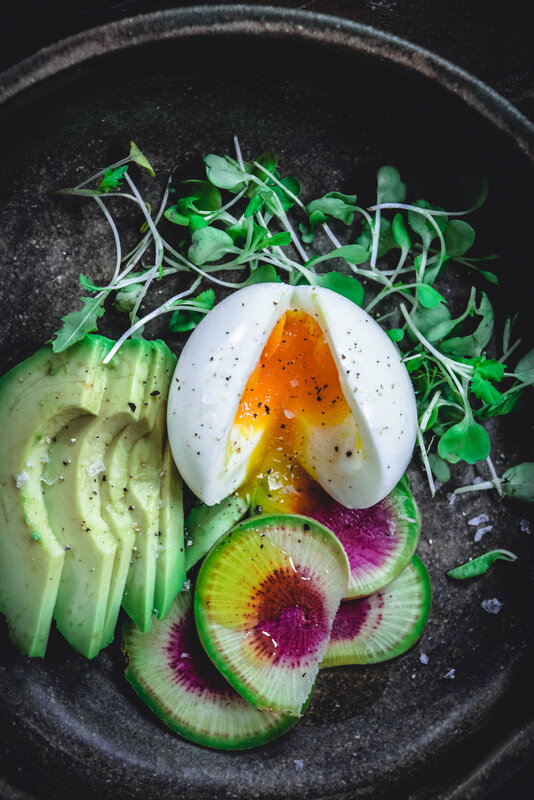 As you can see I have a bit of an obsession with avocado and eggs - rightfully so they're pretty spectacular when combined. So check out this speedy breakfast (or lunch or dinner) you can whip up in 4 minutes. It's also fantastic with a little sriracha drizzled on top! Preheat frying over medium heat. In bowl, whisk together eggs, slat and pepper. Add olive oil to the pan and pour in egg mixture. Evenly distribute it throughout the pan. Let cook for 2 minutes until set then flip and cook for another 1-2 minutes until that side is set. 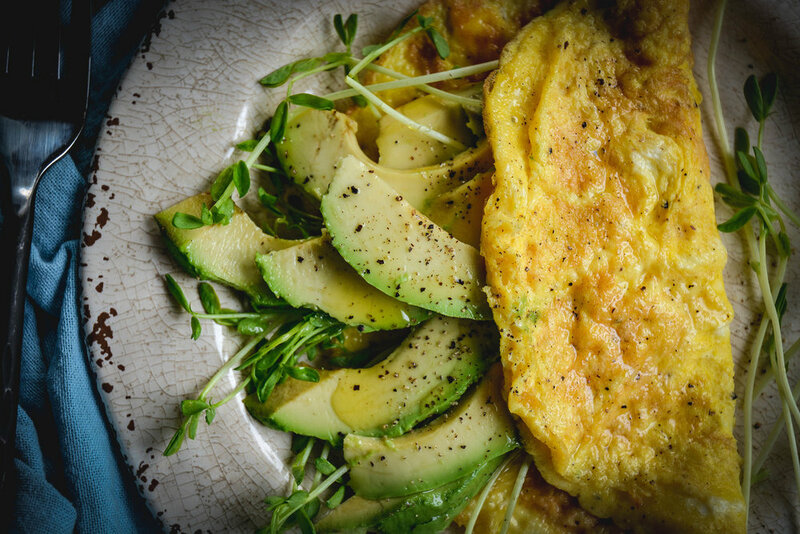 To assemble, place omelette on plate, add sprouts and avocado slices and fold over in half. Optional, drizzle sriracha over top. The good thing about eating a mostly paleo diet is that I feel pretty great these days. The trouble with eating a mostly paleo diet is the planning. I like to delude myself into believing I'm a relatively organized person. I try for the most part. But since there are so many moving parts in my day, from time to time I slip. (Okay often). Onion. This among several other ingredients is what I had to get to make my vegan chili on this snowy Friday night. Daughter in tow, I picked up all that I needed and came home with a bunch of random items only to find myself standing in my kitchen yelling the word: "Oniooooon!" Yes, I had forgotten a vital ingredient. The snow was coming down hard and I was in no way going back to the store. Pizza sounded like a good idea for everyone but then I'd be starving. What to do? I've been here before. Standing in my kitchen, panic setting in as the clock draws nearer to dinner time, desperately searching the fridge for something I could assemble and call it dinner. And there they were! Eggs - so obvious. They always come through for me. I cannot imagine a day without them. I used to think avocado was the one food I couldn't live without but I'm thinking it may have just slipped into second place. For a moment I toyed around with perhaps making breakfast for dinner, which can be fun and all but it just didn't quite do it for me. And all of a sudden it all became clear, zucchini noodles with avocado sauce and an egg on top. Problem solved! Here's the thing about this dish. You can use regular pasta, though I find it works remarkably better when made with zoodles. It's better on your gut health, but since zoodles tend to be a bit on the wet side, which is not always a good thing, this sauce absorbs some of the moisture balancing them perfectly. Oh and did I mention it takes about 10 minutes to make this whole thing? Yeah, it's a win in my book. For pesto, combine 2 tbsp olive oil and all ingredients aside from zucchini and eggs in food processor and puree until fully incorporated. Set aside. Use spiralizer to spiral zoodles. Preheat pan over medium heat and add 1 tbsp olive oil along with zucchini noodles and a pinch of salt. Cook for about 2 minutes stirring continuously until softened a little. Meanwhile in a separate pan over medium heat, add remaining 1 tbsp olive oil and fry eggs. I like my eggs slightly on the runny side but this is up to you. Once zoodles are cooked, add pesto to pan and combine well. 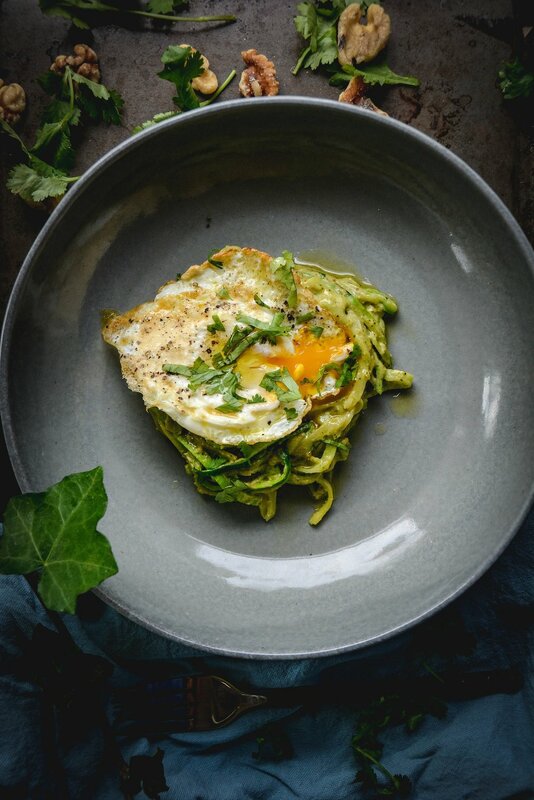 To plate, add zoodles with pesto and top with fried egg. You can add extra olive oil if you wish. When I was in high school, my dream was to become an artist. I didn't know the logistics of it and didn't really care how. I just knew I wanted to. Art was the one thing that suspended the passing of time, if only for a little while. Thoughts would come and go, anxiety's hum practically non-existent and eyes and hands were focused only on the canvas. The world was always right in those moments. I've been thinking a lot about how childhood experiences frame who we become as adults. My association with art goes back to my father. I still recall the strong smell of oil paint lingering in the house on most nights. I was about 7, hovering over his shoulder, peaking at the life he was creating on canvas. A scene from a village in winter. A thin red brush stroke carefully working out the intricate details of a man's long winter coat as he made his way through the snow. I can still see and smell that painting when I close my eyes. I've been buying free range eggs for years, as I'm convinced they not only taste better but nutritionally are far better than regular, Plus there is the ethical part. There's something about knowing that an animal is not being held in confinement that just makes me feel more at peace with eating animal products. While free range eggs are more expensive, I do feel they're worth the money. A few months ago, I've upped the ante and started buying eggs directly from the farm. I'm lucky to have one not too far from me that sells free range, organic, unpasteurized eggs. The whole experience of actually going to the farm and getting eggs, is one I look forward to and one my children equally enjoy.